Why hide what's inside the shower, when you can beautify it? 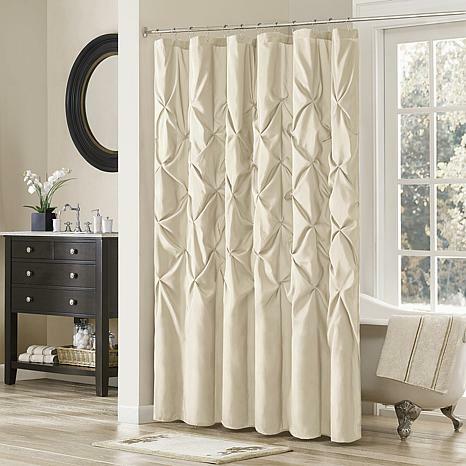 The contemporary look of this curtain drapes exquisitely across your shower for a look that can transform a bathroom. Pair with other Madison Park collection items (sold separately), rinse and repeat! I purchased in the Mushroom color and will be getting it in the Ivory as well to switch off. Love the pintuck design. The material is not thin or cheap looking. I think it adds class and updates the bathroom because it's different and not your standard shower curtain. This curtain is so pretty and soft. I have ceramic tile floor and lots of wooden furniture. This curtain has just soften the look in my bathroom. I Love it. I am decorating bathroom in Ivory/green for spring/summer. While this simple the details give it some dimension. Look forward to decorating in new colors. I TOOK THIS CURTAIN OUT OF THE PACKAGING THEN STEAMED IT TO GET THE WRINKLES OUT. 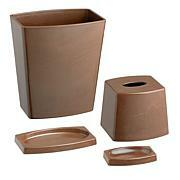 IT IS IN MY GUEST BATH AND THE COMPLIMENTS ARE STILL COMING IN FROM EVERYONE THAT HAS GONE IN THAT BATHROOM! LUV, LUV, LUV! 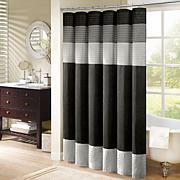 NFL Shower Curtain Your allegiance runs deep, so keep hope alive even in the bathroom with this cool-looking shower curtain in team colors. It's a subtle yet bold way to show your team spirit can't be doused, even in the shower.